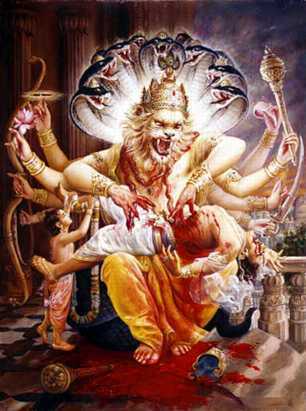 One day Devatas, Munis, Maanavas, did seva of Parameshvara and asked “Svaami! Devaadhideva! make someone an adhipati of vighnams and ganams (give us a Ganapati, Vighneshvara) and bless us”. 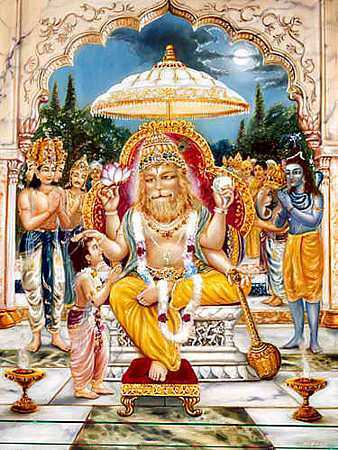 Both Gajaanana and Shanmukha, the putras of Paarvati-Parameshvara, said “Please grant Me Ganaadhipatyam”. Seeing this Paramashiva said “Kumaaras! I will give Ganaadhipatyam to the one of you two who does tiirtha-snaanams (holy-dips) in all the punya-nadis (sacred rivers) in all tribuvanams and comes back here first”. 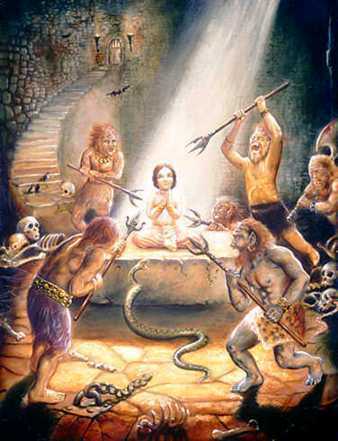 Gajaanana did namaskaarams to Maata-pita and with great bhakti did “Naaraayana” Naama-smarana and stayed in Kailaasam. Because of this, whichever punya-nadi Kumaarasvaamy went, there He saw that His bhraata, Gajaanana, already took bath and was going to another nadi. Like this He saw in all 3 crore 50 lakhs punya-nadis. 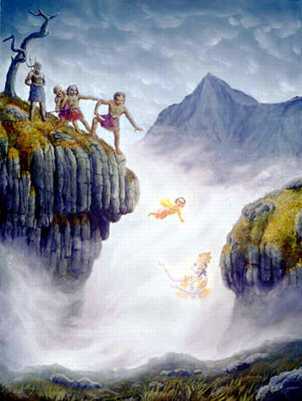 Finally He reached Kailaasam did namaskaarms to Paramashiva and said “please give this Ganaadhipatyam to Bhraata only. Not knowing His shakti, I challenged Him”. Thus Gajaanana was made Ganapati on Bhaadrapada Shukla Chaturthi. Importance of Maata-Pita seva is well shown by Gajaanana. He said there is nothing greater than Their seva and did seva to them. Impressed by this, Paramashiva told Him a way to win the competition. Greatness of Bhagavat-naama-smarana is well shown in the story. As Parameshvara said by doing Naaraayana-naama-smarana, one gets the punyam of doing punya-snaanam in all tiirthas in tribhuvanams. Search Terms: Vinayaka, Vinaayaka, Ganesh, Ganapati, Gajanana, Parvati, Shiva, Subrahmanya.